Sometimes we judgmental humans have a habit of putting other animals in boxes, overly simplifying their complicated lives. We think every owl is wise but there are more owls that watch reality TV than are reading The Odyssey. Humans have always thought cats to be such wise creatures, and though they might have some good ideas we've all seen some cats make some pretty silly moves. Hippos are no different. We think of hippos as hungry, a little scary, and rather clumsy but not all hippos are that way, some hippos are actually remarkably light on their bulky toes. They don't get to hear music very often but when they do they have a surprising knack for rhythm. This particular hippo that you see before you was lucky enough to be hanging out in a nearby swamp when an orchestra was staging an outdoor concert. After hearing that sweet symphony, she was hooked. She knew by the way those strings moved her that she had to find a way to become a ballerina. After she raised the plane fare to make it to New York she auditioned at Julliard and against all odds she made it! 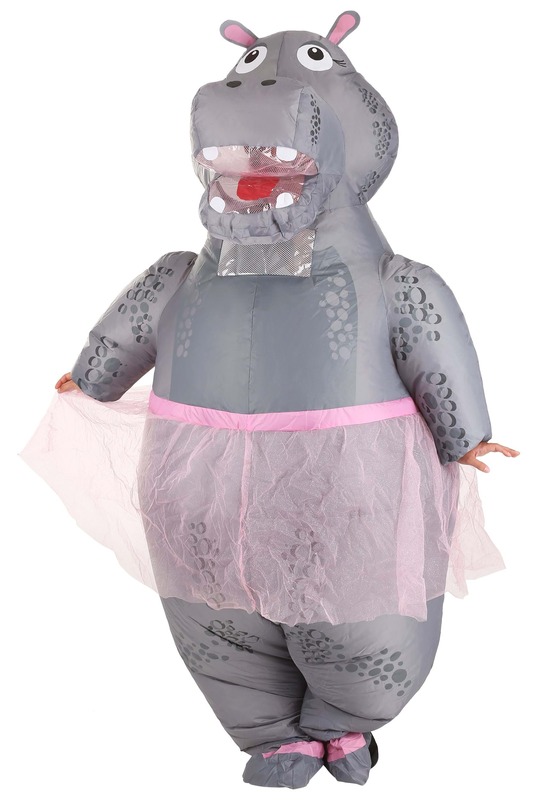 With this inflatable costume you can become this ambitious and graceful hippo. She has lovely spotted gray skin that looks wonderful under the theater lights and contrasts nicely with her pink tutu and ballet slippers. With her long lashes and a positive attitude, she's ready for her debut and you can be a part of it. If Degas could only see this hippo in action!